"I have nothing to offer but blood, toil, tears, and sweat,"
When Winston Churchill addressed the House of Commons on May 13, 1940, as the new prime minister, he did not take the position blindly. He knew the road of war ahead of them would be long, tiring, and taxing. In fact, he had been warning about it for years. Churchill had been in and out of politics from the turn of the century. He held office as a member of the Conservative Party and then the Liberal Party. After losing elections under the Liberal Party, and due to the fracturing of the party itself, Churchill returned to the Conservative Party. Through it all he always considered himself an “anti-Socialist” and a “Constitutionalist”. In the 1930’s, as Hitler grew in power, Churchill sounded the alarm throughout England. He warned against the dangers of nationalism and the threat it posed to Britain and the world. The prime minister at the time, Neville Chamberlain, believed appeasement and compromise was the best method to pacify Hitler. He was wrong. Hitler believed in a “greater Germany” that would rule the world. He had already annexed Austria and now he was set on Czechoslovakia and Poland. In order to keep the peace, Chamberlain and France’s Prime Minister Edouard Daladier, met with Hitler in Munich in September of 1938. Contrary to Czechoslovakia’s wishes, Chamberlain and Daladier gave in to Hitler’s demands and handed a portion the country over to him as a “peace” offering. Signing the Munich Pact on the 30th, Chamberlain left the meeting believing he just brokered the deal of a lifetime. In a speech to the Britons, he assured the citizens he has secured “peace in our time” and brought “peace with honor.” Churchill had a different opinion. He described the deal as “throwing a small state to the wolves.” By March, Hitler had overtaken the rest of Czechoslovakia, completely dissolving it as its own country. Within a year of the Munich Pact, Hitler invaded Poland. Peace would now only be achieved through strength. Chamberlain had no choice but to declare war against Germany. He spent eight months conducting an ineffective war before he lost support of his Conservative Party and the House of Commons. On May 10, 1940, Chamberlain was forced to resign. After years of warning against Hitler, advising Britain to prepare itself and build up its defense, and harshly criticizing Chamberlain for his appeasement policies, Churchill’s fears were proven true. Chamberlain’s incompetence as a negotiator and war leader solidified the nation’s acceptance of Churchill’s knowledge and foresight of the evils at hand. Known for his tenacious demeanor, the “British Bulldog,” usually stood alone in his opinions and often paid a political price because of it. In fact, at the time he had been voted out of Parliament and was known as a writer. Regardless, he never wavered on his principles. That is why when the country needed someone strong, reliable and trustworthy, it turned to Churchill. It was no surprise King George VI called this civilian back to politics, appointing him prime minister upon Chamberlain’s departure. 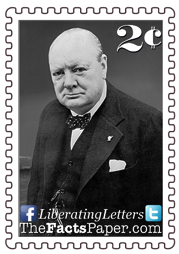 Accustomed to being a lone voice, Churchill led England as the lone resistance to Germany at the start. He worked diligently with U.S. President Franklin D. Roosevelt and Soviet Union leader Joseph Stalin to form an Allied force against Hilter and the Nazis. Churchill continued to forge forward, and was greatly responsible for orchestrating the Allied victory against Hitler. Britain came to understand their need for a strong, principled leader after witnessing a weak and pacifying one, but six years of war and bloodshed took its toll. Tired and frustrated, Britons dismissed Churchill and the Conservative Party just 2 months after Germany’s surrender. Liberty, as history demonstrates time and time again, those who stand for principles, morals and fundamental truths often stand alone. That doesn’t mean the fight is not worth engaging in. Jesus knew this all to well. He lost followers because they could not commit to his teachings. They wanted a Savior that fit into their mold, not understanding it is up to us to conform to God’s template. With the pending nominations of Donald Trump and Hillary Clinton to their respective parties, affirming America’s full embrace of Progressivism, I fear the future of the principled and ideological Constitutionalist is bleak. That being said, you should in no way abandon your core beliefs, especially just to get along or “unite”. As with Churchill, you never know when our Chamberlain will fail and our Churchill will be called to action. At that time, the people must have clear evidence and proof of who that principled person is.